Intel can legitimately be credited with spearheading the recent mini-PC craze with its Next Unit of Computing, but the one knock against the NUC has always been its lack of gaming credentials. That weakness ended Wednesday night, when the company officially unwrapped its Skull Canyon NUC featuring the company’s most powerful graphics core and a quad-core CPU. The new Skull Canyon NUC breaks with the traditional 4x4-inch shape, but the company had good reason to do it: more power. All previous-generation NUCs have been limited to dual-core processors, but this new Skull Canyon NUC features a Core i7-6770HQ. Intel’s famous Skull logo returns for the Skull Canyon NUC but don’t worry, the company bundles a plain cover in the box that can be easily swapped out. Besides packing four of Intel’s latest generation Skylake cores, the chip also features Intel’s most powerful graphics core, the Iris Pro 580. A typical Core i7 or Core i5 CPU with, say, HD 520 graphics, might feature 24 execution units. The Iris Pro 580 features 72 execution units. It also gets a big boost in performance from an ultrafast 128MB of embedded DRAM on the chip. How much performance does that add up to? On one Skull Canyon NUC we played the new game Just Cause 2 at 1920x1080 resolution, with frame rates in the low- to mid-30s. For PC gamers that’s, well, not great, but for integrated graphics, that’s actually pretty impressive. If you really want more power, you can hook up external graphics cabinets such as this Razer Core with a Radeon GPU inside of it using the Thunderbolt 3.0 port. As if it knows that's still not enough, the Skull Canyon NUC has a Plan B: external graphics. In the picture above you can see Razer’s newly announced Razer Core, an external GPU module the company showed off at CES. The Core essentially allows any PC that supports Thunderbolt 3.0 to run a far more powerful GPU. In the demo we tried Wednesday night, Intel showed off an AMD Radeon in the cabinet being unplugged and plugged into the Skull Canyon, and the sky did not fall. 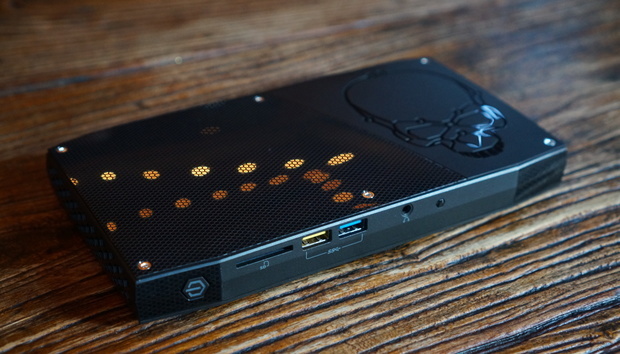 Intel’s new Skull Canyon NUC features a quad-core Skylake CPU with the company’s most powerful graphics core. Besides the quad-core Intel chip, the Skull Canyon NUC can take up to 32GB of DDR4 in a pair of SO-DIMM slots. Although it looks like the PC is big enough to take a 2.5-inch SSD or hard drive, it can’t. Instead, Intel lets you install up to two M.2 SSDs in full x4 PCIe mode, with NVMe support, too. And if you’re really nuts about your storage speed, Intel says you can even run both in RAID 0 mode. With fast-enough M.2 drives, that should put file access in the 2GBps to 3GBps range. Wireless comes as an integrated 802.11ac card that’s soldered to the motherboard itself. Intel made the move to permanent Wi-Fi modules in the last generation for reliability (there’s no card to pop out), cost, and truth (no one ever swapped out the cards). With its Iris Pro 580 graphics, played Just Cause 2 at 1080p resolution in the 30-fps range. The front of the Skull Canyon NUC features an SD card reader and two USB 3.0 ports, plus a combo analog headset jack and integrated IrDA. The back really packs it on with optical and analog audio port, Gigabit ethernet, two USB 3.0 Type A ports, miniDisplayPort, and HDMI 3.0, plus a Thunderbolt 3.0 port. With the latter trio, Intel says you can drive up to three 4K UltraHD monitors at up to 60Hz. Intel officials noted that the ethernet is a commercial-class Intel chip, and the Thunderbolt 3.0 port uses Intel’s Alpine Ridge controller, which means it will handle Thunderbolt 3.0, USB 3.1 Gen 2 10Gbps, and DisplayPort output. The HDMI 2.0 port supports HDCP 2.2. That means if Netflix or Amazon and Hollywood ever agree to let the PC stream 4K protected content, the Skull Canyon NUC could stream it securely to your new 4K TV. Intel doesn’t skimp on ports on its most powerful NUC. The unit can even drive three 4K Ultra HD monitors simultaneously. Intel says the bare-bones Skull Canyon NUC (you bring RAM, OS and SSD) should be available as soon as May for $650. Intel said a build with 16GB of RAM and a 256GB SSD plus the OS, should come in at just under $1,000. As it’s not a wimpy 15-watt CPU inside, the Skull Canyon NUC uses a far beefier 120-watt power brick. At least it has curves.